This unique form of transportation enabled the shepherds to make their way through the countryside, which became particularly soggy after fierce rainfalls. But there were other advantages to traveling several feet above solid ground. For one thing, perched up high, the shepherds could easily see and tend to their flocks of sheep, while keeping their eyes peeled for ravenous packs of wolves. 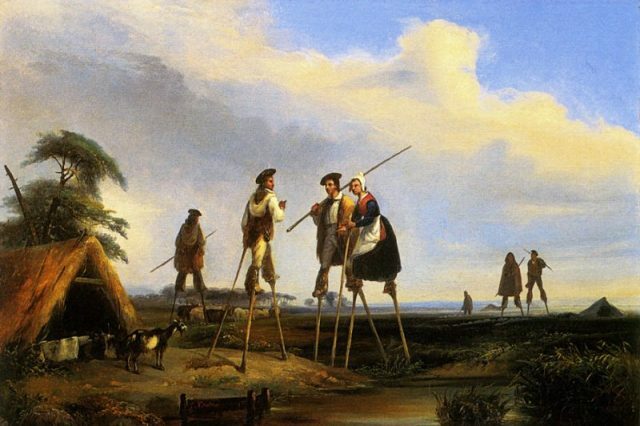 What’s more, the stilts helped them take longer strides, so they were able to cover longer distances in a shorter amount of time. The stilts (called tchangues, or “big legs”), constructed of wood and standing approximately five feet high, had wide straps to support the feet. Shepherd wearing tchangues, c. 1908. The lowest part, which touched the ground, was widened a bit and made sturdy with sheep’s bone, not unlike small hooves. 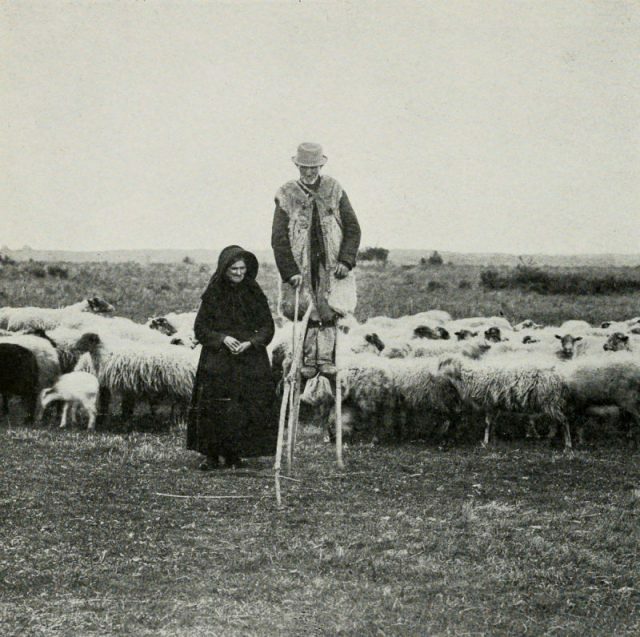 The shepherd would carry a staff for extra support and to aid him in getting onto the stilts. It was also employed as a crook to guide his flock. In fact, the stilts were so remarkably steady, the shepherds were able to live a large portion of their lives at a lofty height. Some were even dexterous enough to work on knitting while watching their sheep. Inhabitants of the Landes by Jean Louis Gintrac (1808—1886), Museum of Fine Arts, Bordeaux. Shepherds weren’t the only ones to possess this skill. 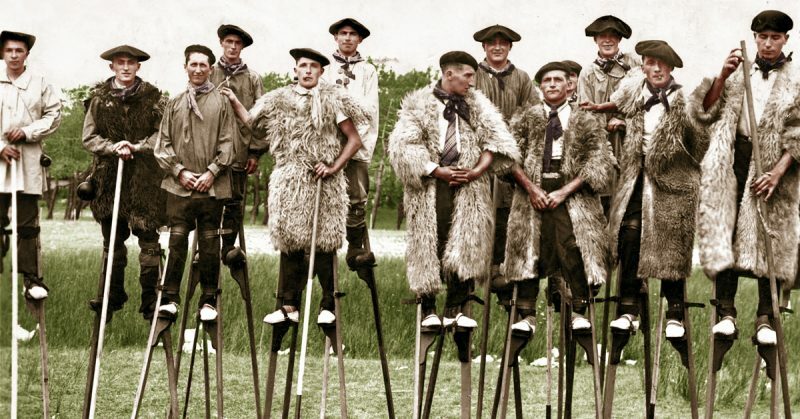 Men, women, and children were all talented stilt-walkers. In fact, they were trained at a young age, learning to perform some fairly amazing feats of balance and dexterity. Women, for example, could pluck flowers from the ground. Mail carriers delivered parcels on poles. 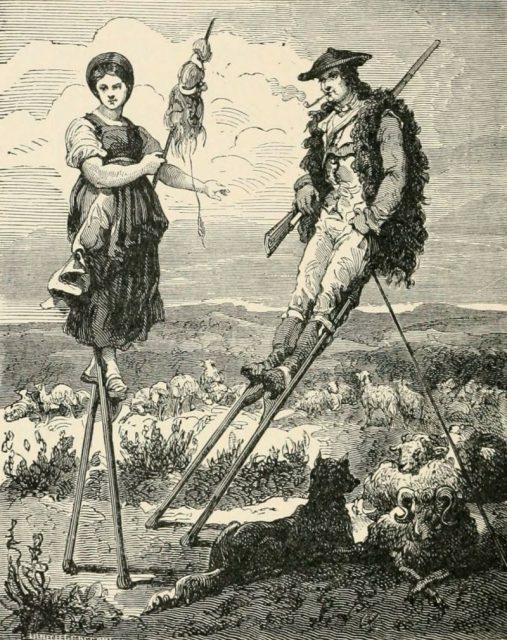 Sylvain Dornon, stilt walker of Landes. All of which delighted visitors to the region. It is said that when Empress Josephine visited Landes in 1808 to meet Napoleon, she and her court were greeted by a group of stilt walkers so adept, they were able to keep up with her carriage horses, much to the Empress’s amusement. The ladies tossed coins on the ground and watched as stilt walkers tussled over the loose change, often resulting in comical falls. 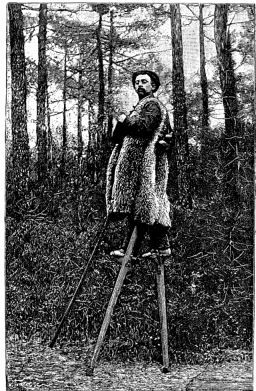 Perhaps most impressive of all, in 1891, Sylvain Dornon walked from Paris to Moscow — a distance of more than 1,740 miles — on stilts. The entire journey took him just 58 days. 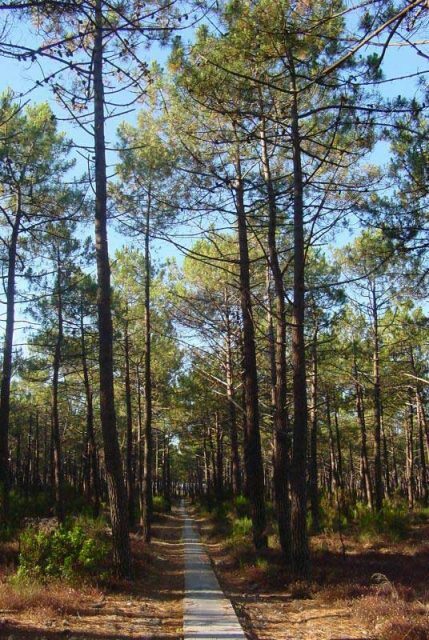 Alas, stilt walking, along with sheep herding, would come to an end in the Landes region by the close of the 19th century, as the marshland was drained and replaced by a plantation of pine trees. But the remarkable skill hasn’t died out entirely: Stilt walking is still performed today at local folk festivals.